Dry Tortugas National Park is known for its famous bird and marine life, and its legends of pirates and sunken gold. Fort Jefferson, one of the largest coastal forts ever built, is a central feature. U.S. military attention was drawn to the keys in the early 1800's due to their strategic location in the Florida Straits. Plans were made for a massive fortress and construction began in 1846, but the fort was never completed. The invention of the rifled cannon made it obsolete. As the military value of Fort Jefferson waned, its pristine reefs, abundant sea life and impressive numbers of birds grew in value. 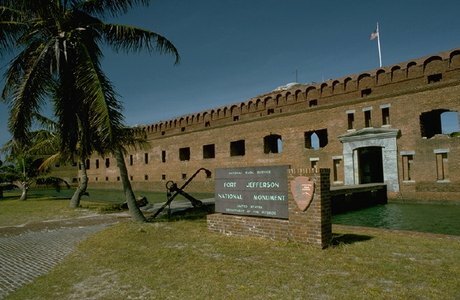 In 1935, President Franklin Roosevelt set aside Fort Jefferson and the surrounding waters as a national monument. The area was redesignated as Dry Tortugas National Park in 1992 to protect both the historical and natural features.